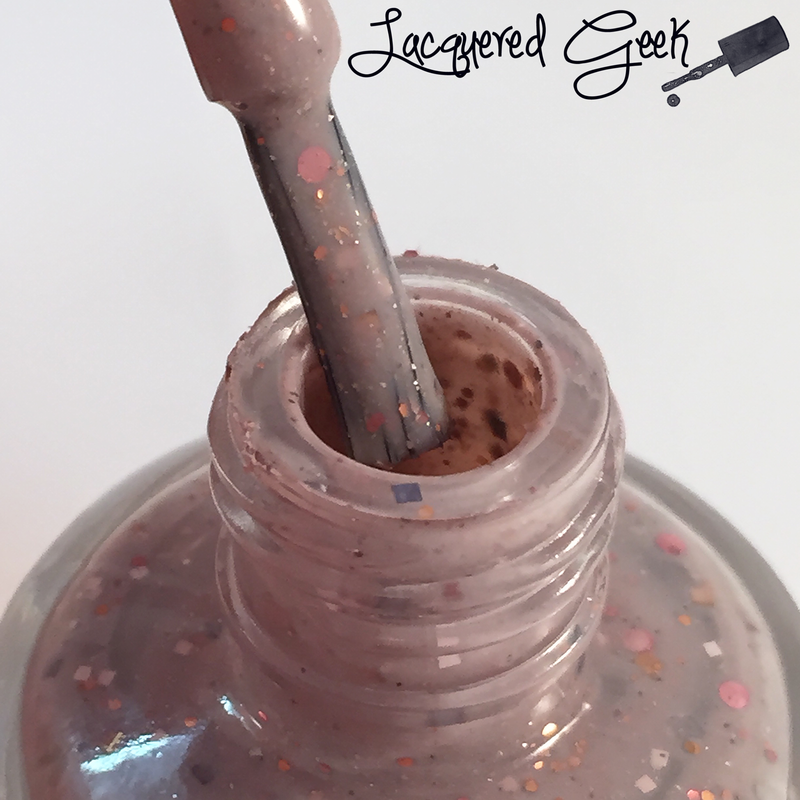 Lacquered Geek: Mystery Polish Time! Happy Friday guys! I hope you are staying cool where you are! Luckily the temps here haven't reached as high as they forecasted earlier this week, but it's still way to hot for me! While I tend to shy away from big polish boxes that are a complete surprise, I do like smaller surprises. There's a big difference between the risk of being disappointed over a $50 polish box vs. a single $10 polish. 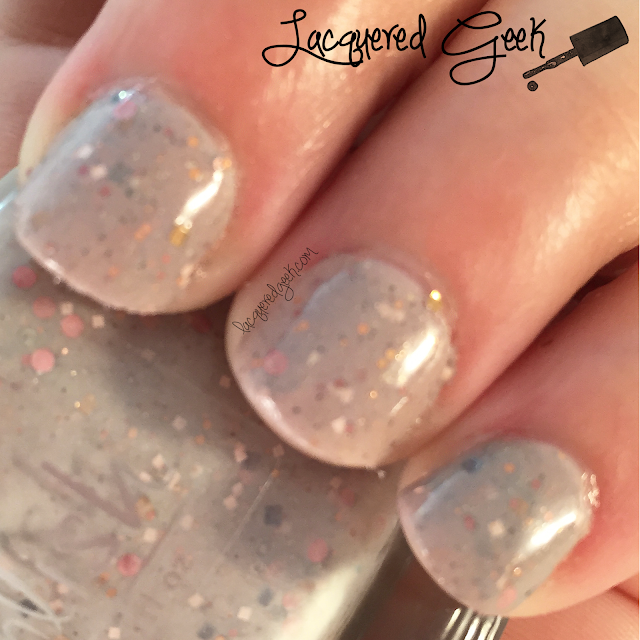 One of my favorite makers, Pahlish, often has mystery polishes on her site. Sometimes, it is mystery holos or mystery Bespokes. I have never been disappointed with any of the ones that I've received. Today, I want to share my most recent mystery polish from Pahlish that I purchased in March 2015. This mystery polish has a lavender-tinged taupe base that's full of gold, light pink, white, medium pink, black, and orange glitters in various shapes and sizes. It's a pretty unique shade. I used 2 coats for these photos. The formula was a little on the thick side, but it was still workable. Of course when I looked at the photos that I took, they all looked great. It wasn't until I was adding my watermark that I noticed that they were a bit blurry. But you can still get the gist of the polish. This macro really showcases the variety of glitters! Do you like mystery polishes? Do you have a favorite brand to pick up mystery polishes from? I loooove mystery polishes! I am sometimes disappointed, but I can never help myself. You're right about the box v. individual polishes, though. And I feel like you can't go wrong with Pahlish! Everything she makes immediately becomes my new favorite! 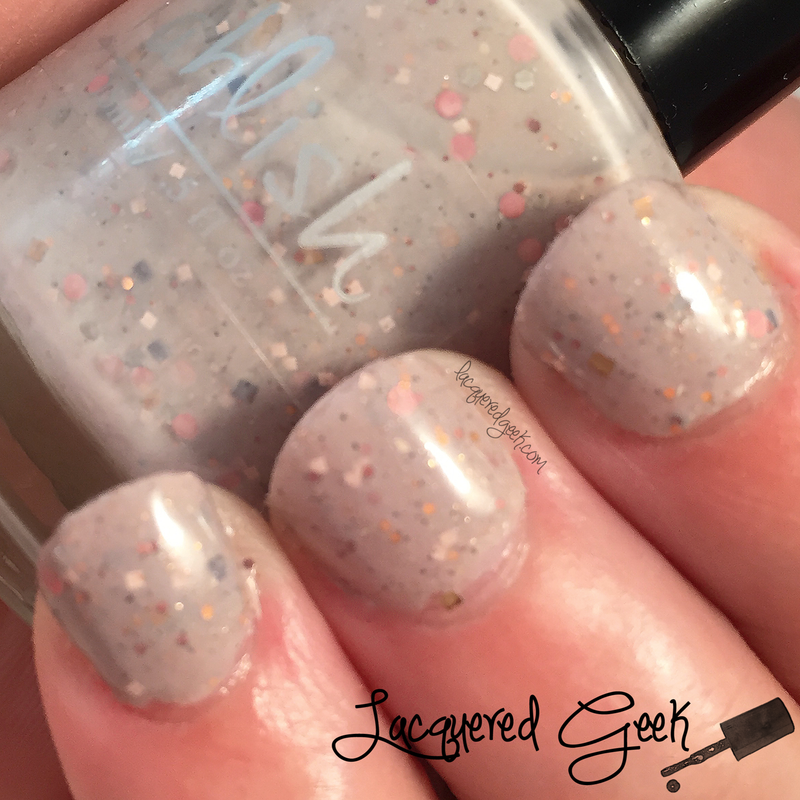 This taupe looks lovely on you, and the combination of glitters and flakes is totally unique! I love a good SFW color! What a lovely combo of glitter and flakes.